Dimensions: 4-1/2 x 6 in. 192 pages. Hardcover. This handy guide resurrects the fine art of frugal housekeeping with over 500 tips on saving money throughout the home and garden. Learn creative ways to cut back, pinch pennies, reduce, recycle, and re-use. Want to save on the grocery bill? Buy the whole chicken rather than individual cuts. Get more wear out of your wardrobe? Add a dash of salt to the washer to keep your darks from fading in the laundry. Lovely vintage-inspired line drawings and a beautiful foil-stamped cloth cover make this an ideal stocking stuffer or newlywed gift. 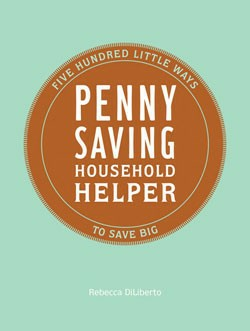 Best of all, Penny Saving Household Helper is a bargain in and of itself. At $12.95, it's just a little over two cents per tip!